Long serving clients of Audio Plus, United Music got in touch after their successful event in Prague last year to discuss the possibility of taking the Vero system over to Thailand. 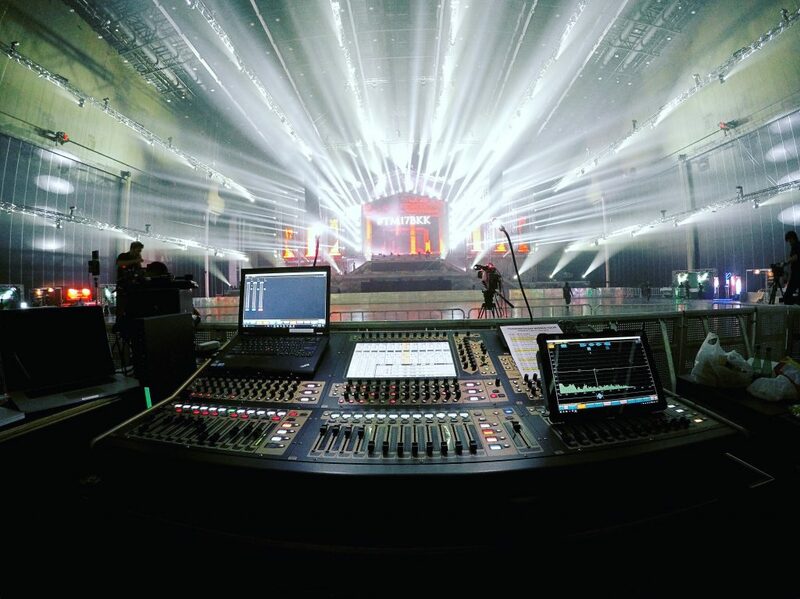 Here at Audio Plus, we like a challenge, we like the prospect of having to organise logistics & resources to ensure our clients receive the best possible audio at their event no mater where in the world it maybe. The decision was made to send 1 40ft container to Bangkok with everything we needed to do an arena show with. Space was at a premium. Fortunately when Vero was in its design stage early on in it’s life (when the name Vero hadn’t been decided), Funktion-One ensured that Vero would utilise space within a standard shipping container. This meant we could pack the container tighter ensuring we had the right equipment for the job. Rock-It Cargo arranged all the transportation for the event and ensured there was enough time to get the container from our warehouse in Colchester to the BITEC arena in Bangkok. January 27th arrived and the container was loaded. In just under 6 weeks the equipment arrived at BITEC ready for our load in. System technician, Mark O’Neill opted for LR flown arrays of Vero consisting of V60’s, V90’s and V315’s. The trustworthy Resolution 5 enclosure was used for outfills & flown delays with a pair of PSM12’s providing lipfill. Low frequency support was furnished with 24 V221 sub bass enclosures in a electronically steered broadside array. The system was processed through Audio Plus’ bespoke LAKEDrive system consisting of a Dante based network distribution with analogue redundancy. Wireless control was provided by our new Microsoft Surface Pro 4 tablets running Lake Controller which meant system tech O’Neill could ensure every audience member had a consitant sound.